Kathy Culmer is the Director of Religious Education. This position encompass coordination of all the religious education at St. James’ including adults and children, Sunday School, Vacation Bible School and the various ministries to young people. In addition to her other duties, Kathy recruits and trains volunteers. Kathy has been a parishioner at St. James' for several years and, in addition to her several volunteer capacities, most recently served as New Members Ministry director. She has earned her Doctor of Ministry degree from the United Theological Seminary in Dayton, Ohio. Kathy Hood Culmer is a graduate of Spelman College and the University of South Florida. 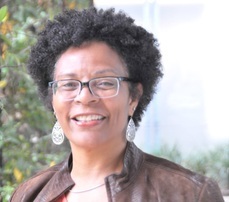 She is an author, storyteller, teacher, and retreat leader who has told her stories in churches, schools, libraries, at festivals, on college campuses and in business settings. Kathy has been a workshop presenter at the National Storytelling Conference, the National Christian Education Conference for the Episcopal Church, National Conference for the Episcopal Church Women, National Episcopal Youth Event, as well as part of a biblical storytelling mission trip to Gambia in West Africa. She is the former Mission Funding Coordinator for the Episcopal Diocese of Texas. Kathy is the author of “Big Wheel Cookies: Two for a Penny,” published in “The Rolling Stone and Other Read Aloud Stories,”, is editor of a collection of personal narratives called “Yes, Jesus Loves Me: 31 Love Stories,” and has authored meditations in “Forward Day by Day,” a devotional guide.